Special thanks to those who donating the temple and support the nam kwak + somdej. Sorry for not being in here for quite a long time cause been busy with other stuff. Thanks heavenlzh for your kind update on this thread. Update: For those who pre-ordered the Nam Kwak & Somdej, your order has been submitted and stock has been reserved for you, once Archan Tia finished chanting and its about near to "Phapa Event" on 8/31, the representative will collect the amulet and send out to you using the postal method of your choice. Archan Tia per day spent many times to meditate and chant the amulet, each katha will chant 108 times. The nam kwak test possession video is about to release, please check the blog or forum frequently to get latest update. For those who order other ready scared item from Wat Sungai Siput such as Tiger Skin Takrut, pitta and etc, your item has been sent out on last tuesday and you should have received it by now. Thank you once again to everyone who support the development of Ubosot at Wat Sungai Siput and sorry for the very late update of me because i have forgot that i opened a thread in this forum. The chanting session of Nam Kwak & Somdej amulet has begun and it will last for the rest of 3 months until the “Phapa” event on 31/08/2010. Each session of chanting and meditation will take at least 30 minutes, it will be started by chanting and follow by meditation. Arjan Tia use many katha for this batch of amulets, as I know it will have major katha (big katha) follow by katha that use for business, wealth and metta. As you can see they are many items besides of Nam Kwak & Somdej that mixed and chanted together but don’t worry because each specific katha will “goes” into specific item and will not mixed up. Each day Archan Tia will spend at least 3 session of chanting which is morning, noon and night time especially in morning and night time Archan Tia will spend many session for the chanting because there are less visitor during this period. Once all the amulet has been fully powered up, it will be tested by letting people to feel its power in trance. Trial possession will be conducted by letting devotees to hold the Nam Kwak amulet and go into possession. When everything is tested and “Quality Assurance” done, and before it can release to public, it must be “inform” to the devas in heaven, to do so a ceremony of praying will have to set on the day of “Phapa” where you will see many stuff such as pig head, chicken, meat, fruit, water and etc offer to devas. Maybe this is part of the procedure of amulet making in dharma thai that must be followed or I don’t know, maybe its from the way of other related disciplines. People said you get what you pay for, so you get your nam kwak & somdej amulet not just by paying money but you also paid contribution to the development of ubosot, this is something very meaningful. He say he dont like to have "soft launch" because need to do many things, committee may not free and once chanted people will start to ki tang, the situation will be chaos. He said he dont need to have soft launch of amulet to catch people's attention, in ancient time those great monks like arjan toh (somdej) or lp dam, derm also just meditated and chanted alone in their room at night before sleep. The Nam Kwak amulet that will be released on 31/08/2010 at “Phapa” event has been put out on test to see whether it holds sufficient power after 1 month of continuously meditate chatting by Archan Tia. The results is optimized, 2 out of 3 testers were successfully possessed by Nam Kwak, the female godness of wealth. The test possession were conducted at Wat Sungai Siput on devotees that offered themselves to do the test, the first tester is from Sungai Petani and he is currently facing financial problem, he get possessed so quickly that don’t even require the chanting assistance from Archan Tia. This is his fresh possession, he never get possessed before by anything in any form but on that day right after Archan Tia pin the Nam Kwak amulet on his cloth using a small plastic beg, his body start shaking and go in trance very quickly. The last 2 testers were Mr. Ng (the committee member of Wat Sungai Siput) and his friend. Mr. Ng get possessed after like 7 minutes of chanting aid by Archan Tia, unfortunately his friend didn’t make it and this is because not everyone is familiar to deal with the spirit that either want to possess or communicate with us. The Nam Kwak & Somdej amulet will be keep chanting by Archan Tia until the day of “Phapa”. For those who are interest to try getting possessed using Nam Kwak amulet you can do so at Phapa event on 31/08/2010. It will be the first ever of its kind; the purpose is to let the people to feel the power of the amulet and also to make believe that there are supernatural powers in the universe that we live, maybe it goes further than just belief, maybe we can consider it as cosmic science, whatever it is, it certainly worth for us to observe, discover and learn something. And in addition of this, 100% of the revenue that generated through amulet sells and donation will be used to construct the Ubosot building. Lets together do something very meaningful for the coming Phapa inconjunction with the celebrating of our nation’s independence day (Merdeka) on 31st August. I would like to special thanks the admin of this forum for your kind generously for allowing this thread to be kept for the purpose of fundraising programme of the Ubosot building at Wat Sungai Siput. how long does it take to travel from singapore to Wat sungai siput? Dear Richman, thanks for your kind query. If you take the flight from SG it takes about 1 hour to reach the LCCT KL airport, then from KL you will need to take the domestic flight to airport in in kedah. From KL to kedah by air take about 1 hour. Totally you need to travel by air 2 hours from SG to reach KL in 2 flight. Once you reach kedah airport, you will have to travel by land and it takes about 1 and half hour to reach Wat Sungai Siput because it located in the northern region of Kedah, its in the rural area. Im not sure if taxi driver know how to take you there. If you guys want to visit here i would suggest you invite few more peoples so that you guys can rent a van or something. If im free i should be able to tour guide you guys. oh thx for the offer , will try to plan my time if possible i would like to visit LP and of cos personal receive the amulet from him directly. Dear Richman, you are most welcome. Sorry for my typo it should be 2 hours from SG to Kedah (1 hour from SG to KL, 1 hour from KL to Kedah). Please kindly check the airlines website for more info, query from airasia or firefly. If you ever need help please do not hesitate to ask. Dear heavenlzh, thanks for your kind notice it is much appreciated. Good news again... Archan Tia release Luong Phor Top Loop Lor (his master) which he made in year 2000. 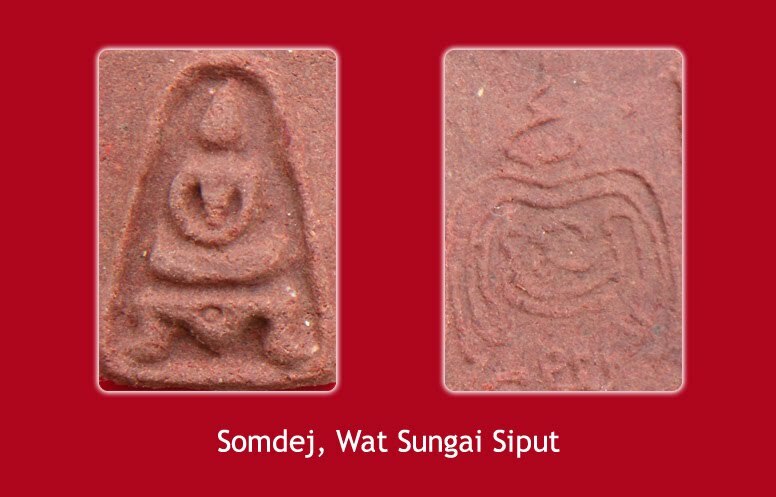 This batch of Luang Phor Top amulet is made by Archan Tia when he first establish Wat Sungai Siput on year 2000. They are few hundred in number and chanted with the one and only one of Luang Phor Top katha. 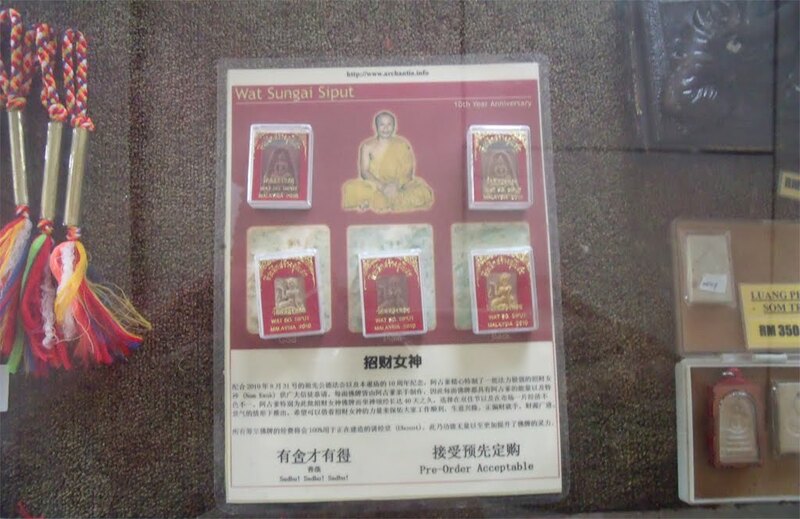 The purpose of making this batch of amulet is to let the Malaysian devotee to know about his master which is Luang Phor Top. Archan Tia said he used to give away this amulet for free but people refuse to accept it because they dont know who is Luang Phor Top, so he just keep them in his room until now he decided to display it out for people to rent since devotee in Malaysia started to know the legend of Luang Phor Top from amulet magazine. The price is RM100, it can be more higher but Archan Tia said he wants to let devotee to have the opportunity to own the amulet of his master therefore he wont set the price too high, so that it affordable by everybody.